Jake Smith, performing as The White Buffalo, conjures a mythic portrait of America. The White Buffalo debuted his first full-length album, Hogtied Like a Rode in 2002, followed by The White Buffalo EP. Jake hit the road and performed with acts such as Ziggy Marley, Jack Johnson and Grace Potter and the Nocturnals, among many others. His latest album, Once Upon a Time in the West is set to release February 28th. Heralded by critics such as NPR as "an amazing storyteller," The White Buffalo's songs are rooted in everyday struggles, on both epic and personal scales, with elements of blues, country western, folk and classic rock. Jake's "herd" boasts the talents of Matt Lynottt on drums and Tommy Andrews on bass. 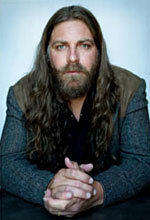 The White Buffalo is bringing his alt-country sound and storytelling lyrics to The GRAMMY Museum. Along with the performance, The White Buffalo will engage in a short discussion with Vice President of The GRAMMY Foundation and MusiCares Scott Goldman and will take audience questions.